Interview: Paul Spicer | Fourthwall Magazine & The Drama Student – The magazine for careers in the performing arts – actors, drama students, directors, producers, writers, production crew. He seems to have it all. An amazing West End job, his own company producing concerts and theatre, his own Summer School, and time for holidays. How's Avenue Q going at the Wyndham's? I love it, it's wicked. I think the show needs an intimate venue. The building's got a lot of excitement in it as well. They woop and cheer for us at the beginning of the show and it's packed. It's obviously a great footfall there on Leicester Square. I thought you were brilliant. You took over from Daniel Boys though, who was really popular. Did you feel the pressure? [Slight pause] I don't feel pressure taking over a role, because I know that I'll be compared. People latch on to certain performers and they love them for their reasons and that's absolutely fine. I learnt a lot from Daniel. I've known Daniel for years. In fact he really took me through the audition process. I got to play with the puppets like more than anyone else. So when I came to do my final audition, I was really used to them. They're big shoes to fill, but also I'm aware that it's a really big deal, going into a show where you're having to learn a new skill. I wasn't going to give myself a hard time because I'll get there in the end, but it's going to take a bit of time, and every day I find something new in it. 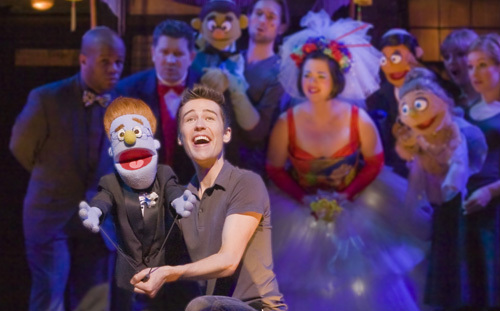 Why do you think a musical, based on a bunch of puppets, has been so popular? I remember going to see it a lot when Julie Atherton first opened in it, she's like one of my closest friends. If I had a night off or whatever and I fancied a laugh. It's got a big heart, it's just really funny for all the wrong reasons. It holds a mirror up to what everybody really is, so if you're very truthful and you know yourself, I think you'll like Avenue Q. But also the puppets are just so fascinating. It's just got this magical little formula. We interviewed Julie Atherton, she said it's difficult to describe the show. Well it's a snap shot of life on a street in New York, and you get to know the characters that live there, but they all go through the same dramas that you go through in day to day life, so there's a lot to relate to. But it holds general issues like jobs, life, love, relationships, and with a comedy slant on them. You look after the journey of two characters, Princeton and Rod, two very different characters, but both on a path of personal discovery. What's your favourite to play? I don't have one. From day to day it changes, and that's all down to how comfortable I feel with the puppet on the day. One day Princeton would just be much more part of me, and I feel like I can get the fun, and other days I don't really have the energy level, I have to really work at finding him. Rod is more uptight, and I'll find that is easier that day. Is it difficult to go from one character to the next so quickly? Yeah – especially when you're on stage doing both of the voices! And also there's times when I literally finish a really big piece in the show as Rod, I'll walk off stage right and someone will literally pull Rod off my hand and push Princeton into the other, towel me down, give me a drink, I'm on, and I've got a line. It's literally within about the space of ten seconds. So that in itself, to get into the thought process and to really make you understand where Princeton's just come from and where Rod is going, is just impossible at times, but actually when you've nailed it, you really realise because the audience kind of go [makes funny noise]. What was it like getting the connection with the puppets in rehearsal? Oh beyond anything I have ever done before. The pain of learning how to puppeteer is something that I never really realised would come, and that's why I train a lot now at the gym. Every tiny fibre of me needs to be really strong, otherwise it just cramps and just kills all the way down the right side. Everything on your right side goes all weird because you have to compensate. A little bit like if you did twenty press-ups on one arm, you'd feel the burn. At the beginning, I think it was my first Saturday matinee, I just had a massage, and I was like: “Oh this is great, I feel really relaxed,” and then I was in Everyone's a Little Bit Racist, and I turned to Cassidy [Janson] and it went.. [makes a convincing spring sound], and I couldn't move. You just have to deal with it. On the plus side, you're going to have a really muscley right arm.. I do have a really muscley right arm! [Laughs] My forearm really is rock solid, and I've only done [the show] for two months. I'm going to be like Madonna! Whoo. What was training like at Arts Ed? Amazing, amazing, amazing, Arts Ed is an amazing amazing, amazing, amazing place. It was amazing. Yeah, as much as I possibly can, I love it. I would do it for free, but they have to pay me something! I work with the students a lot because of the productions that I co-produce. I've created a bursary last year for students who don't have any money, it's called.. The Notes.. erm.. [Paul gets confused Р Business partner Neil Eckersley reminds Paul it is the Christmas From New York CD]. We recorded a CD and once it breaks even, the bursary will be informed by that money that comes in. You've obviously done so much that you've just forgotten which is which! I have no idea anymore! It's clear you've got an entrepreneurial streak, having co-founded Notes from New York, so i guess it's been important for you to take control of your career? I suppose discovering new talent is integral to the series? Yeah, completely, and just about giving everyone a voice. Tell us about your summer school – Taking Notes? It should be a place for actors to come and rediscover, if you've got issues with auditions and you just want to get in the right head space. You get to work with a young team of people that are out there doing it at the moment, some people will come in from shows and directors that you've probably heard of, and what I love is getting composers in, because you just never get to do that in the real world as an actor. So to get them in is a bonus. Last year we had just so many amazing breakthroughs, people going “I just can't believe how much this has given me a boost, a kick, the confidence to carry on” and that's the point. If you could meet your 16 year old self now to give him some advice, how would that conversation go? Ooh. I think I'd say: “Have more faith in yourself. Don't stray from the path that you know that you want to follow because other people make you.” I'd say “keep focussed”, because there's been times in my life when I've not necessarily been focussed and I think I wasted that time. That's one thing I hate, more than anything in life, is wasting time. Paul – hope this gets to you. Have made the decision to move Thomas to arts ed in Sept – would love you to talk to him about it. He was thrilled to get in. We are so proud to know you. Is he too young for your summer school?